"Dr. Fisher, is it true that I have to pay ABIM $155 to maintain my certification even though I passed my boards? And do I have to do this for life? I went to the ABIM website and it really isn't clear what we have to do." I explained the ABIM's current iteration of fees and testing as best I could in the brief time we crossed paths. 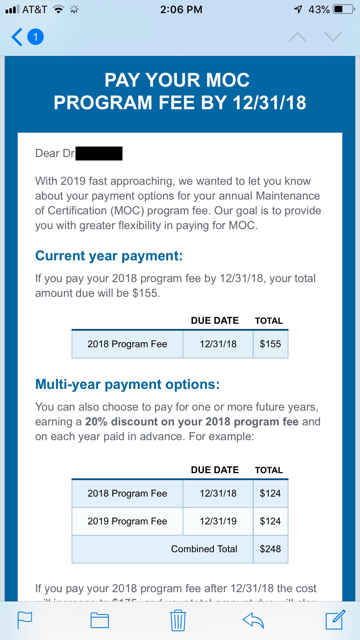 The ever-shifting sands of the ABIM parsed fee and "point" structures, "discounts," programs, credits, and value of participating (or not) in Maintenance of Certification have lead, I believe intentionally, to the current chaotic state of US physician Board certification. I felt sorry for him but was not surprised he was confused, especially since explaining the board process was equally difficult. I sensed he knew that speaking candidly about his concerns with others in positions of leadership might compromise his reputation as a hard-working, reliable cardiology trainee and was grateful he felt he could approach me with his concerns. ""They also included a discount on multi-year payment." "$155 is my annual savings during fellowship..."
Can the DOJ letter be distributed to all state medical boards and all state attorney generals with information such as this poor cardiology fellow to see what the ABIM/ABMS is doing? Can we start demanding clawbacks and payback of usurped money? It is simply extortion. Nothing else.